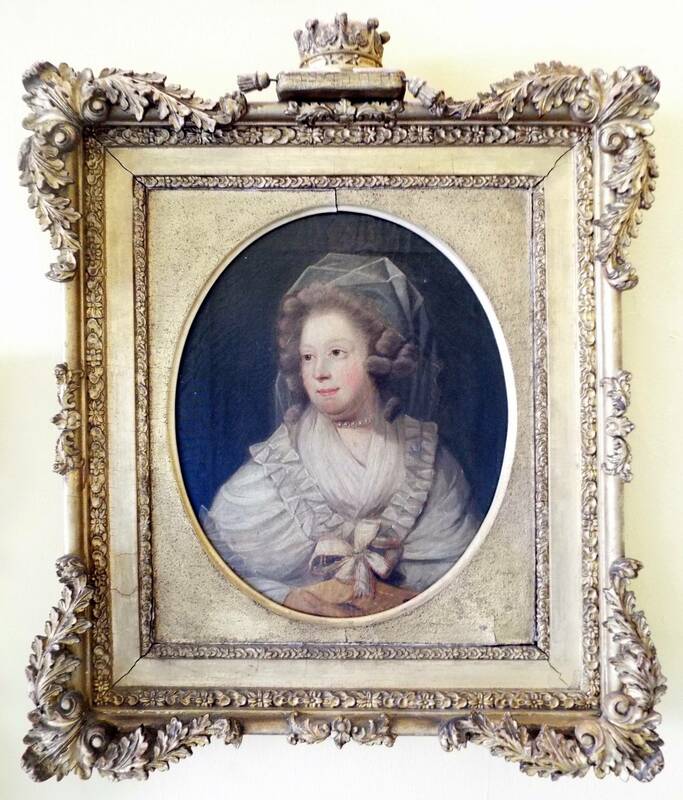 Scroll down this page to see portraits and read brief biographies of some of the family members associated with the Caulfeild family and the estate at Marino. You may also find the following links useful: the Caulfeild family on the Peerage, the Caulfeild family website, and the Charlemont Manuscript Collection at the Royal Irish Academy. Click on any portrait to see it larger. Toby Caulfeild was born in Oxfordshire, England, the son of Alexander Caulfeild (c. 1520 – c. 1581; also known as Alexander Calfhill). A military man, he was sent to Fort Charlemont on the border of Tyrone and Armagh in 1601 by Queen Elizabeth. For his services to the Crown, James I granted him over 25,000 acres of land in Northern Ireland over the next twenty years. This included land from the old O’Neill estates in Tyrone, the confiscation of which he supervised from 1607-10. It was on these lands that he build Castle Caulfeild, now in ruins. He died in Dublin and is buried at Christchurch Cathedral there. 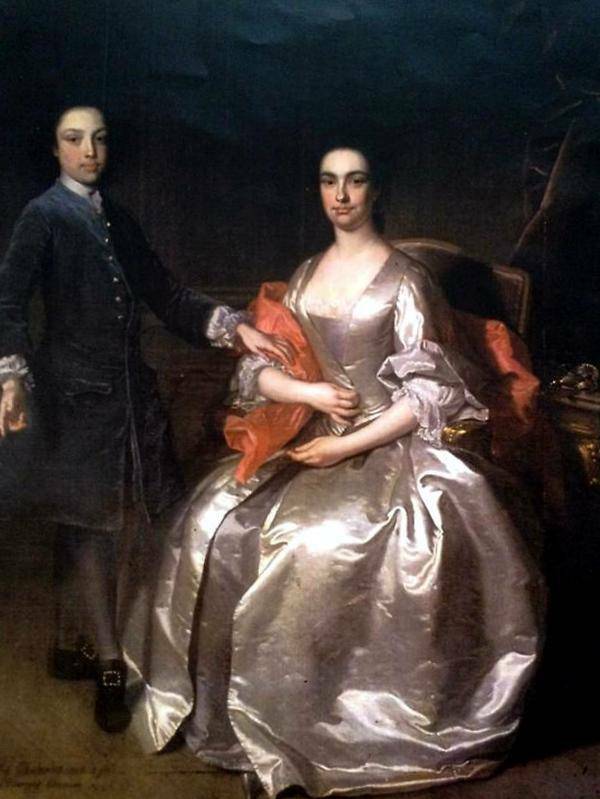 Elizabeth Bernard, from Castle Mahon, Co. Cork, married James Caulfeild, 3rd Viscount Charlemont (1682 – 1734), in 1723 when she was twenty years old. They lived in Jervis St, Dublin, where he attended parliament as MP for Charlemont in Armagh. Elizabeth and James had at least six children together before he died eleven years later; three survived beyond infancy. These were Francis, Alice, and James. On the death of his father, James became 4th Viscount Charlemont. Six years after the death of her husband, Elizabeth married Thomas Adderley (1713 – 1791) from Innishannon in Cork. They lived in Dublin, and had one child together; Elizabeth Adderley. 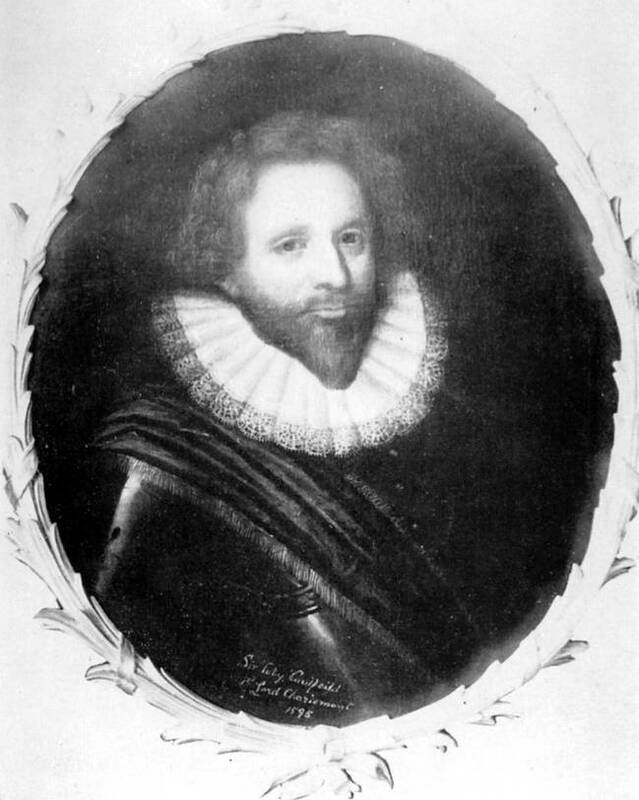 Thomas Adderley was an active and involved stepfather to James Caulfeild, providing advice and help to him throughout his transition to adulthood and after. He was buried in St Mary’s Church on Mary St in Dublin; today his gravestone can been seen among those leaning against the back wall of what is now Wolfe Tone Park. On the death of his father in 1734, James Caulfeild succeeded to the titles 8th Lord Caulfeild, Baron of Charlemont and 4th Viscount Charlemont. It was not until 1763 that he was created 1st Earl of Charlemont, as recognition for keeping the peace in the Armagh/ Tyrone area. He was well-known for his love of the arts, and spent a record nine years on Grand Tour through Europe, Turkey, and Egypt. With the help of his stepfather, Thomas Adderley, he established himself at Marino on his return to Ireland in 1755. Here he began the improvements to his Marino estate, one of which was the celebrated Casino. He was a leader in many different areas of eighteenth-century Irish society. Instrumental in setting up the Royal Irish Academy, he was also its first President. He was a member of the Royal Dublin Society, and a supporter of Grattan’s parliament. He was also a founding member of the Irish Volunteers (formed to protect Ireland from invasion while British troops served in the American Revolutionary War). His contribution to Irish culture was significant and lasting. Mary Hickman was from Brickhill in Co. Clare, and married James Caulfeild in 1768, when James was forty years of age. It was rumoured that James had left bachelorhood reluctantly, and only because he wanted to block his brother from inheriting his estate at Marino (Francis had differing architectural taste). However, James and Mary seem to have had a happy marriage; a letter describes how she read works of scholarship aloud to him after his eyesight had become weak with age. They had four children: Elizabeth, Francis, James, and Henry. On the death of his father in 1799, Francis became the 2nd Earl of Charlemont. After her husband’s death, Mary continued to live at Marino, until her own death in 1807. She is buried with her husband in Armagh Cathedral. 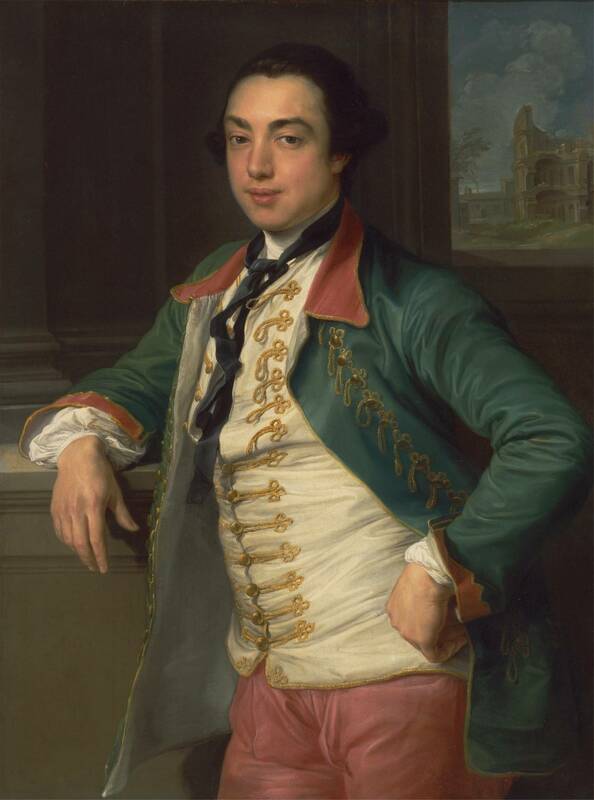 Francis Caulfeild was the son of James and Mary above, and succeeded to the title of Earl on the death of his father in 1799. Until 1799, he had represented Armagh in the House of Commons. From 1806, he sat in the House of Lords. He had a keen interest in horticulture, and sat on the botany committee of the Royal Dublin Society. His name and that of his head gardener also frequently appeared in newspaper reports, as the winners of prizes for best flowers and fruit in agricultural shows in Dublin. He maintained and further improved the estate at Marino, as well as the other family residences in Charlemont House on Rutland Square, and Roxborough Castle in Co. Tyrone. It was at the house in Marino that he died in 1863, before being buried in the family crypt in Armagh. Anne Bermingham of Ross Hill, Co. Galway, married Francis Caulfeild on the 9th of February, 1802. 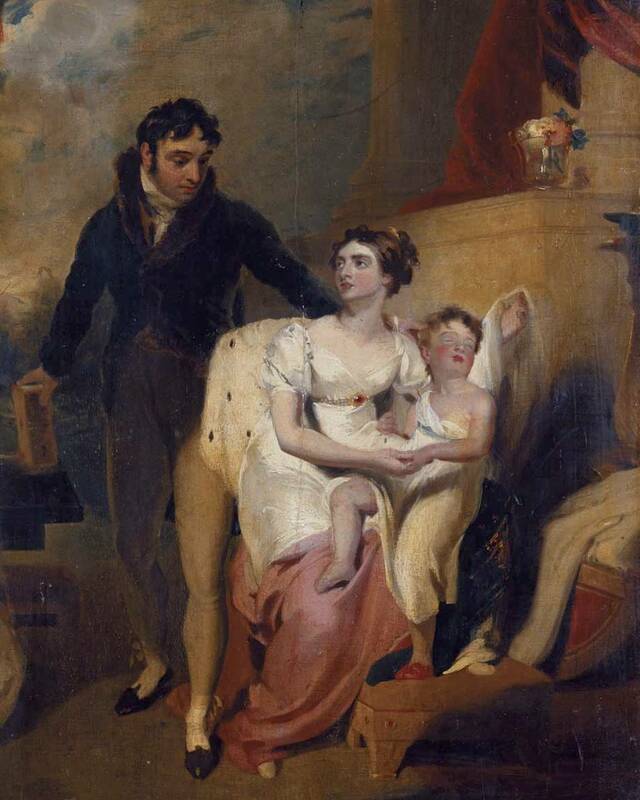 She also appears in the portrait above, with her husband and child. She was a celebrated beauty in her youth. 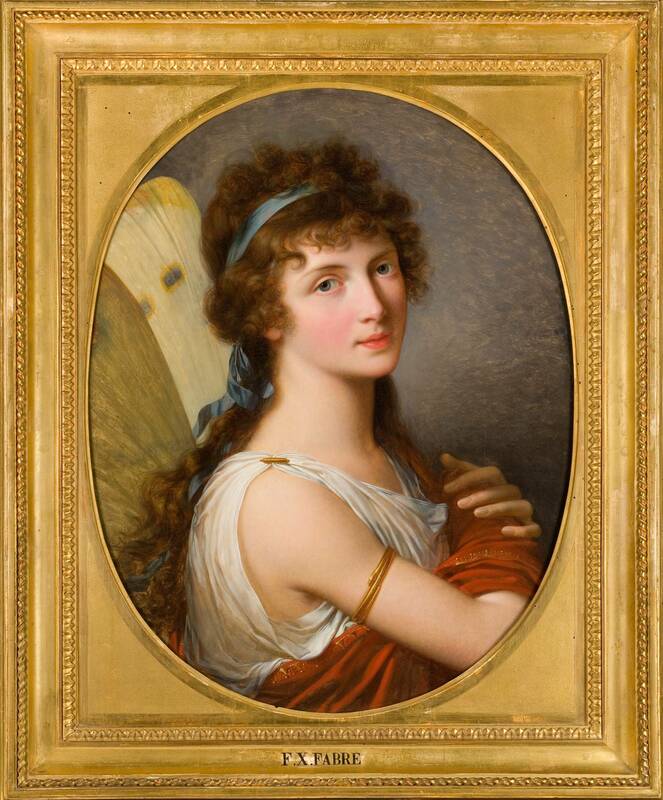 Opposite is a portrait of her dressed as the goddess Psyche by Fabre; a copy of this portrait was famously made by Princess Louise, Countess of Albany. A bust of her by Joseph Nollekens was exhibited in Windsor Castle; Lord Byron wrote of his intense admiration for the beauty of this work and its muse. 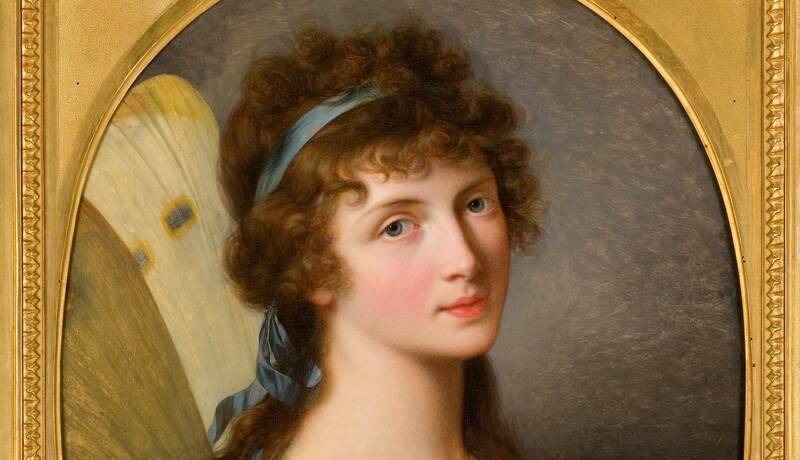 He wrote of Lady Charlemont’s beauty in other venues too, leading to speculation about their friendship. Anne and Francis had four children – James, William, Maria, and Emily – all of whom died before the age of twenty-one. In later life, they seemed to live quite separate lives. On the accession of Queen Victoria, Anne was appointed Lady of the Bedchamber, and lived in London. Her address when she died, at the age of ninety-five, was Grosvenor St. Some watercolours and sketches she made while a young wife in Marino can be viewed in the National Library of Ireland. As Francis died with no living heirs, the title of Earl of Charlemont passed to his nephew, James Molyneux Caulfeild. 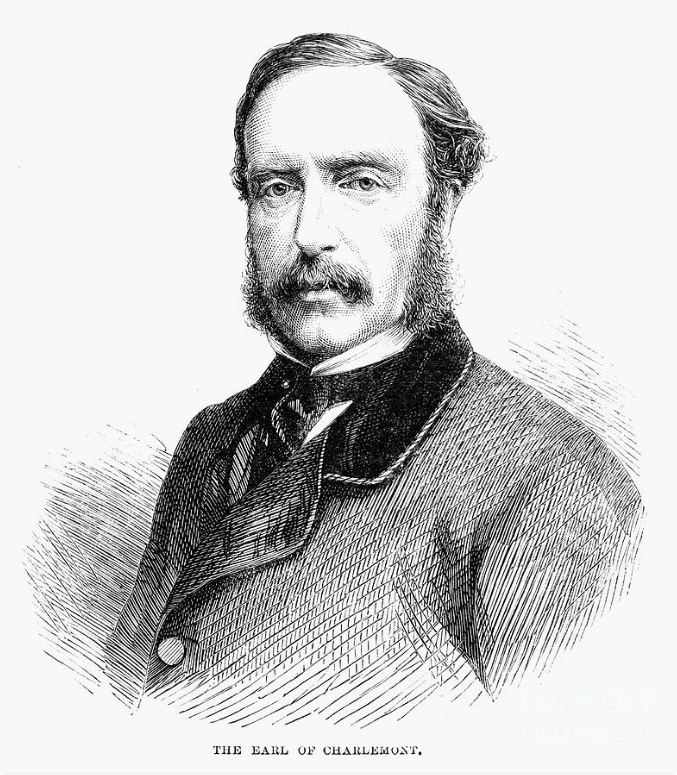 James Molyneux Caulfeild was the son of Henry Caulfeild, and therefore grandson to the 1st Earl. He inherited the title from his uncle, Francis. He was born in Hockley, Armagh, and lived there until he moved to Cambridge for his education as an adult. He was later High Sheriff and MP for Armagh, as well as Lord Lieutenant for Co. Tyrone. Basing himself wholly in the north of Ireland, James lived at Roxborough Castle which, on the death of the 2nd Earl, he began remodelling and extending with the architect William Barre. Some items from the Dublin residences were transported north and reused in this house. On the death of Anne Caulfeild, he sold the estate (Casino included) at Marino to Cardinal Cullen, who donated most of it to the Christian Brothers. After James Molyneux Caulfeild, the title of Earl of Charlemont did not continue, although the title of Viscount continues down to the present day, the current holder being the 16th Viscount Charlemont.